The compositions of Michael Wertmüller, as diverse as they may be, can all be seen as contributing to solving the problem, how does density originate? Density – mediated as energy, brute force, loudness, tempo, etc – results here from extremely gracefully built structures that are folded into each other, linked, and associated such that they result in a great whole. But the graceful build is not exhausted in the compositions, but only elevated. It is audible all along as a trace, as a necessity (as reason, cause). Wertmüller plays out this dialectic of fragility in these compositions to its completion. This is meant literally: his music is derived from a sheer inexhaustible richness, but despite all its aggression, it also has an audibly luxurious character. The 35-year-old Wertmüller played for years as the drummer in the Swiss Free Core/12-tone Death Metal band Alboth!. As an improvising musician he can be heard with Peter Brötzmann and Stephan Wittwer. His compositions are performed all over the world. die zeit. eine gebrauchsanweisung was premiered during the Donaueschingen Festival for New Music in 2001 by the chamber ensemble Neue Musik Berlin (the soloists were Stephan Wittwer and Mark Trayle). Entleibung was performed live and manipulated by the European String Quintet and Alex Buess on live electronics in December 2002 in Bern, Switzerland. After a half a dozen CDs wit Alboth! 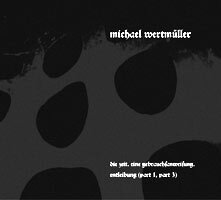 and several improv recordings with Peter Brötzmann and Stephan Wittwer (W2, GROB 204), this is the first recording that presents Wertmüller as a composer. Further recordings will follow.